Is one of your friends or family currently obsessed with this “anime” thing and you have no idea what gift he or she would like? Check out our recommendations for ideas on the perfect anime-related gift. I have no idea what the anime fan in my life is watching! Hmmm well, that’s a problem. Like movies, books, or TV, anime covers a wide range of genres—from horror to comedy, action to romance. Moreover, there are between 40 and 60 new anime released each season in Japan, so recklessly buying a DVD or a figure on a whim because “it’s anime” is definitely the wrong move. Thus, before buying anything, it’s important to find out what anime they currently enjoy. 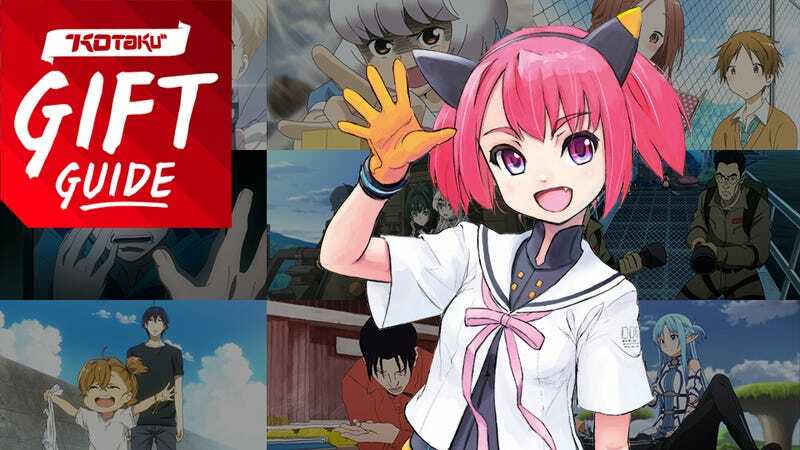 If you want some names to throw out, Kotaku’s seasonal “five anime you should be watching” guides (Winter, Spring, Summer, Fall) should give you a starting point. You may also want to ask about Naruto, One Piece, Dragon Ball Z, Neon Genesis Evangelion, Sailor Moon, Attack on Titan, or any movie by the critically acclaimed Studio Ghibli. These are all big names in anime with appeal that has lasted years—and in some cases, decades. Okay, assuming I am able to discover the name of an anime that my anime fan likes, then what? Well, now a whole world has opened up—namely the world of merchandise. If you have access to your anime fan’s room, take a peek inside. Do you see anime posters, figures, CDs, or anything similar? If you do, then it’s safe to start your shopping. There are many places online that import anime-related items directly from Japan. Armed with the name of a particular series, it’s simple to find items from that anime. However, you’ll notice that things like figures tend to be expensive, so don’t be afraid to go small and grab a T-shirt or a key chain as a gift if you’re on a budget. Isn’t there something I can buy that doesn’t require me knowing their favorite anime? Absolutely. You know how Netflix allows you to stream movies to a PC, tablet, phone, or game system pretty much anywhere anytime? There are several similar services that do the same thing—only for anime. Now while all the following sites stream much of their content for free (especially the currently airing shows), paying for an account usually nets bonuses like no commercials, HD episodes, or getting episodes a week before free users do. Crunchyroll: This service tends to have the largest selection of new anime each season and often streams them as they air on TV in Japan. They also have a growing selection of live-action Japanese dramas. If your anime fan watches shows week to week, Crunchyroll is your best bet. Funimation: If an anime’s not on Crunchyroll, it's usually on Funimation—especially if it’s one heavy on the action or fanservice. If your anime fan already has a Crunchyroll account, grabbing a few months of Funimation for them will greatly supplement their viewing. Hulu: Regardless of whether an anime starts off airing on Crunchyroll or Funimation, the vast majority eventually end up on Hulu in the weeks or months following their first run. And remember, Hulu has far more than just an impressive selection of anime—in its archive, it has thousands of the most popular TV shows ever put on the air available for your fan to watch. Good try but I’m sure that my anime fan already has a subscription to those. Got anything else? One of the best of these visual novels, Steins;Gate, was released this year. It’s a sci-fi adventure about a man who discovers time travel and all the repercussions this discovery has on his life and the world in general. It really is a fantastic story and the game is even better than its also amazing anime adaptation. Similarly, if your anime fan has a PlayStation Vita, there are two excellent visual novels that were released this year Danganronpa 1 and Danganronpa 2. Both are murder mysteries involving a group of genius highschoolers locked away and told that the only way to escape is to kill one of the other students—and get away with the crime. Morbid, yes. But they are also filled with excellent logic puzzles and have a story presented in an anime style that fans are sure to enjoy.